Helvetica. Arial. Comic Sans (LOL!). These are some of the most famous fonts you can find online and in print. Let's add another worthy contender to that list: Cats. Yes, cats. As pointed out by Japanese sites Togech and Weekly ASCII, the upper and lower case characters are called "Neko Font" (ねこフォント), which is Japanese for "Cat Font". The two cats that appear in Cat Font are named "Raizou" and "Mondo". They are adorable. The font is created from photos of these two furry friends. You can write all sorts of things in Cat Font. Here, Japanese Twitter user @KeiichiSennsei wrote, "I love you". Because what better way to say that than writing it in cats? And here is "I am a cat". Written. In cats. This is the Cat Font for upper and lower case "I", "R", and "Y". Looks like "R" is a half-cat! And aw, isn't "Y" so cute? Where on Google Street View Can I Find This Wonderful Half Cat? 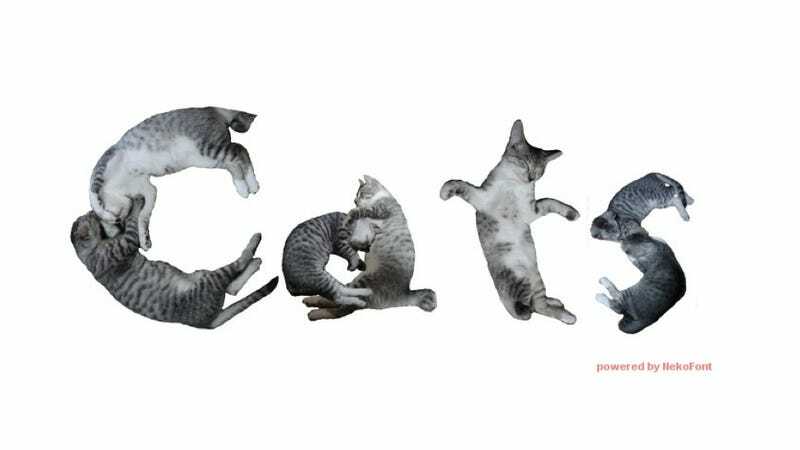 In the link below, you can type your own words in feline typeface, which just might be the purrfect font. And in case you missed it, here is more of Kotaku's very important cat coverage: from cat cosplay to scary cat photobombs and why cats like sitting on keyboards.